On September 21st, seventeen students came here from Kanazawa College of Art to learn how to introduce specialized research and study into their Aesthetics & Art History course. Leading researchers briefed their operations at the Performing Arts Studio of the Department of Intangible Cultural Heritage, the Library of the Department of Art Research, Archives and Information Systems, and the Restoration Materials Section of the Center for Conservation Science. On August 31st, twelve members of the executive committee for the program of “Cultural Properties Protected by People and Museums Protecting People” visited the Institute to refer to its research activities on disaster prevention and risk management. The members were given an explanatory tour by researchers at the Biological Science Laboratory of the Center for Conservation Science, as well as a lecture from Director Ken OKADA. In line with the new medium-term plan, we changed the name of departments and sections for the sake of simplicity as of April 1st, 2016 as per the attached chart. Your continued understanding and support will be very much appreciated. On November 5, they visited the Institute to take a close look at our equipment to be used as a reference against new equipment they planned to purchase. The visitors toured the Center for Conservation Science and Restoration Techniques, where leading researchers explained their work. 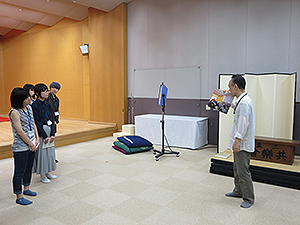 On November 17, the students visited the Institute to obtain information on folding screen painting techniques from our experts in the restoration of Japanese paintings for their reference in the investigation of the conditions of Japanese folding screens at the University, as well as in determination of their restoration approaches. 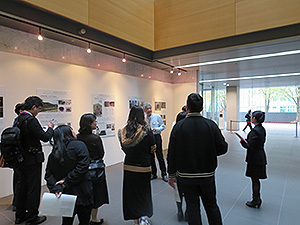 They toured the Japan Center for International Cooperation in Conservation, where leading researchers explained their work. On October 5, the students visited the Institute to foster better understanding of our latest activities, such as research on domestic and overseas cultural properties and cooperation in the safeguarding of cultural properties, for the promotion of their on-going study. 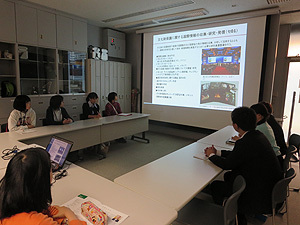 Leading researchers briefed participants on their operations at the Library of the Department of Art Research, Archives and Information Systems, the Performing Arts Studio of the Department of Intangible Cultural Heritage, and the Conservation Science Section of the Center for Conservation Science and Restoration Techniques. 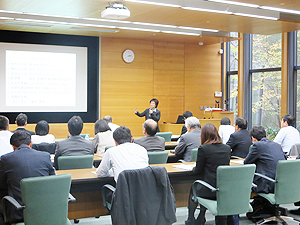 In addition to these, at the Japan Center for International Cooperation in Conservation, global activities of the Institute were also introduced by a researcher in charge. 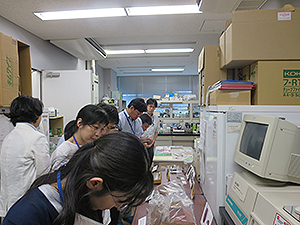 As part of the training for new hires of the Independent Administrative Institution of the National Institutes for Cultural Heritages, 44 staff members visited the National Research Institute for Cultural Properties, Tokyo, on July 10. They toured the Library of the Department of Art Research, Archives and Information Systems, the Performing Arts Studio of the Intangible Cultural Property Section and the Physical Laboratory of the Center for Conservation Science and Restoration Techniques. The staff members in charge of each section explained the work they do. 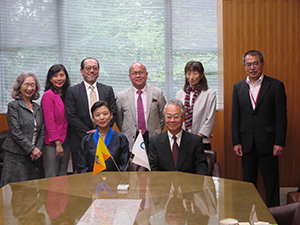 As a part of student training, visitors from the National Taipei University of Education visited the Institute on April 3 to learn about the Institute’s projects and the results of its research. The visitors toured the Library of the Department of Art Research, Archives, and Information Systems and the Performing Arts Studio of the Intangible Cultural Properties Section. 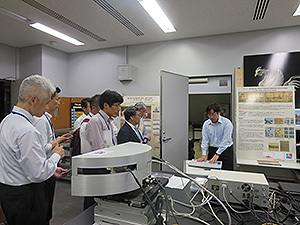 The visitors also viewed a display of the Center for Conservation Science and Restoration Techniques on “Conservation of Modern Cultural Properties: The role of the National Research Institute for Cultural Properties, Tokyo” at the lobby of the Institute. Leading researchers in each sections explained their work. 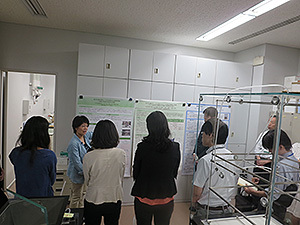 In the Japan Center for International Cooperation in Conservation, researchers described the Institute’s international efforts. 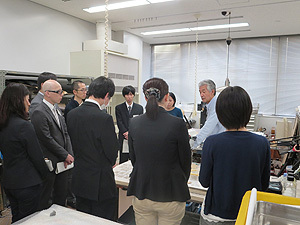 On January 19, visitors from the Society of Photography and Imaging of Japan visited the Institute to tour facilities of preservation and restoration techniques for cultural properties and facilities of scientific research and digital archive. Visitors also toured the Library of the Department of Art Research, Archives, and Information Systems and Chemistry Laboratory No. 3 of the Center for Conservation Science and Restoration Techniques, and staff members in charge of those facilities explained their work. Afterwards, visitors attended a lecture by SHIRONO Seiji, artificer of Department of Art Research, Archives, and Information Systems. 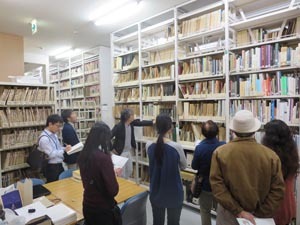 On December 1, personnel from the Juming Museum visited the Institute to inspect about the research activities of and the collection of art materials and management of digital archives by National Research Institute for Cultural Properties, Tokyo. 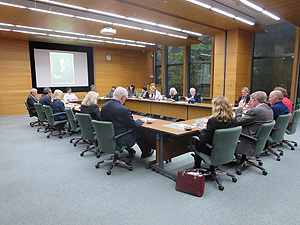 The visitors discussed research efforts with researchers in the Department of Art Research, Archives, and Information Systems in detail. 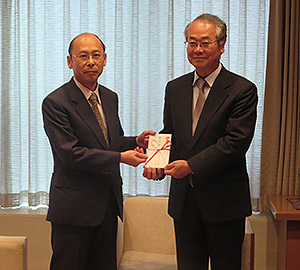 On December 19, personnel from the New Taipei City Library visited the National Research Institute for Cultural Properties, Tokyo to visit its facilities. The visitors inspected a library of the Department of Art Research, Archives, and Information Systems. Researchers in a library and the Archives Section explained the work they do. 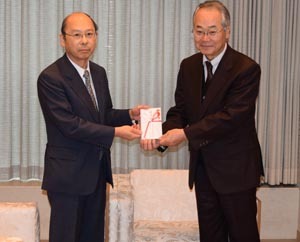 Offers for donations to the Institute were received from the Tokyo Art Dealers’ Association (Director: NAKAMURA Jun) and the Tokyo Art Club (President: MITANI Tadahiko). The Tokyo Art Dealers’ Association aims to fund publication of the Institute’s research results and the Tokyo Art Club intends to fund the Institute’s research projects. 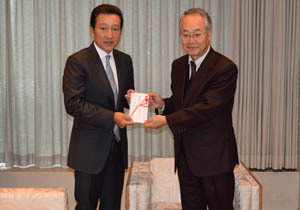 We received the donations with great appreciation on November 5 at the Tokyo Art Club. 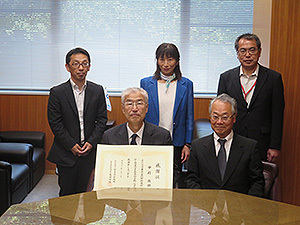 KAMEI Nobuo, Director General of the Institute, presented a certificate of appreciation to both Mr. NAKAMURA, Director of the Tokyo Art Dealers’ Association, and Mr. MITANI, President of the Tokyo Art Club. We are glad both organizations are aware of our activities and we are most grateful for their donations. We look forward to using these donations to fund our activities. On October 22, Dr. Thomas Gaehtgens, Director of the Getty Research Institute of the American J. Paul Getty Trust, together with four staff members and 11 of the institute’s trustees, visited our institute to observe our activities. 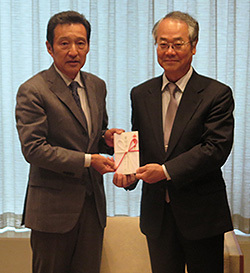 The purpose of the party’s visit to Japan was to tour historic sites and other points of interest in Kansai and elsewhere in Japan, and to carry out fact-finding relating to cultural property research. We welcomed the party at our institute, and began by explaining our organization and other general information. 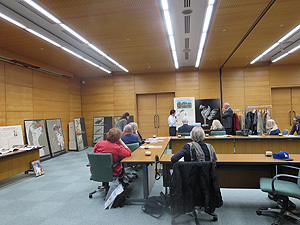 Then YAMANASHI Emiko (Deputy Director, Department of Art Research, Archives and Information Systems) discussed the paintings of KURODA Seiki, who was connected with the founding of our institute. Next, HAYAKAWA Yasuhiro (Head, Analytical Science Section, Center for Conservation Science and Restoration Techniques) introduced some of the latest research results using fluorescent X-ray analysis of works such as the Chinese phoenix of the Phoenix Hall of Byodo-in temple. Dr. Gaehtgens said that the Getty Research Institute, which conducts a diverse range of research work including disseminating information on art research, has a strong affinity with our institute, and would like to collaborate and cooperate in the future. It was decided to continue discussions on fields with potential for research collaboration. 29 participants in “The Training Session for Restores of Cultural Properties (artworks and craftworks)” organized by the Agency for Cultural Affairs, Japan. On October 31, training session participants visited the Institute in order to view the work it does as a national center for research on cultural properties. 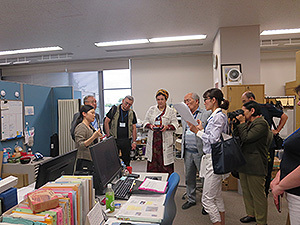 The visitors inspected restoration laboratories, a restoration studio (urushi), and a biology laboratory 1 of the Center for Conservation Science and Restoration Techniques and a performing arts recording studio of the Department of Intangible Cultural Heritage. The staff members in charge of each section explained the work they do.